Ever fancied going to the Super Bowl? How about the Kentucky Derby or the Champions League final? 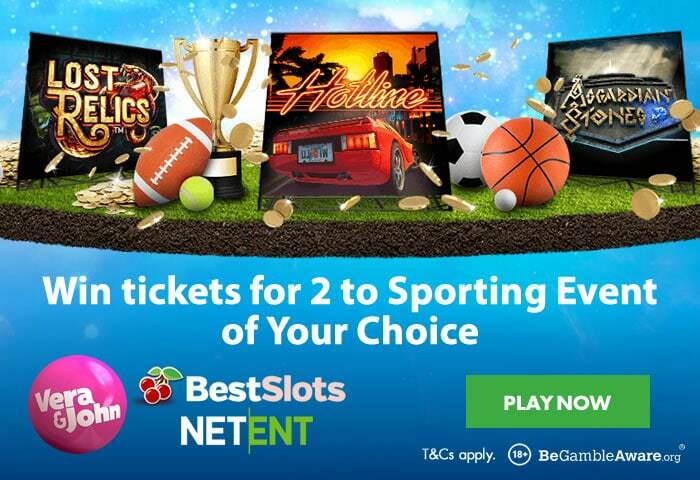 If you’re a sports fan and there’s a major event on your bucket list that you haven’t managed to tick off then head of over to Vera & John Casino as they are giving away a dream package for sports fans. The winner of the Just the Ticket giveaway will win a prize package for 2 worth £5,000 to the sporting event of their choice. And that’s not all. Another 100 players will bag prizes of between £15 and £500 in cash too. So how do you make your sporting dreams come true? Just get spinning on Hotline, Asgardian Stones or Lost Relics from Net Entertainment between now and 10am on Tuesday the 6th of November (2018). Every £1 wagered will get you a point. The 100 players with the most accumulated points will each win a prize with the overall winner grabbing the sporting package plus £500 in cash. Hotline is a 5 reel, 30 payline cop drama that centres on a pair of detectives modelled on the stars of Miami Vice, Crockett and Tubbs. Beautifully designed, it comes with re-spins with stacked wilds and a free spins round where the wild reel remains locked in place for the duration. Epic Norse adventure is the theme on offer in Asgardian Stones, a 5 reel, 20 payline, Avalanche Reels slot game. Helping your winning chances here are the giant 2×2 and 3×3 symbol blocks. The Colossal Crush feature sees oversize symbols deliver a succession of wins complete with expanding multipliers. There’s also a free spins round with 2×2 and 3×3 wild blocks. Undiscovered antiquities can deliver rich rewards in Lost Relics, a 5 reel, cluster pays game. This treasure trek is livened up thanks to the wealth of extras on offer. After any spin you could receive a bonus prize of between 3 and 30 times your stake, 3 extra wilds or a scatter that could help trigger the feature round. That feature round awards 10 free spins where uncovering treasure chests can deliver even bigger rewards. Play Hotline, Asgardian Stones and Lost Relics at Vera & John Casino and it could get you to the sporting event of your dreams. BestSlots.co.uk readers are entitled to 20 no deposit bonus spins on Thunderkick’s Zoom as well as a 100% first deposit bonus up to £50.